Besides being the largest gathering of human beings anywhere in the world, the Kumbh Mela can evoke the deepest spiritual sentiments of an individual. The Kumbh mela is by far the largest religious phenomenon in which the collective destiny and spiritual urges of the human race find expression. Kumbh is a Sanskrit word meaning “pot” ,“pitcher” or “jar” and mela means “festival.” According to Indian mythology, the Kumbh mela derives its name from the pot of the immortalizing nectar. Held at the confluence (sangam) of the three most holy rivers in India: the Ganga, the Yamuna, and the subterranean Sarasvati, the Kumbh Mela lures the faithful for a dip in the holy waters that relieves lifetimes of karmic reactions. There is a scriptural understanding that bathing on the astrologically propitious “peak” holy days extinguishes uncountable sins, relieving the pilgrim of his or her entanglement in the complex cycle of birth, disease, old age, and death. One can thus transcend the mortal world of perpetual reincarnation, of duality and suffering, and hasten one’s return back home, back to Godhead. A veritable sea of swaying bodies and heads moves inexorably to the confluence. Accompanied by the cacophonous clamor of bells, cymbals, horns, whooping, the shouting of invocations, and the constant blaring of devotional songs over a ubiquitous P.A. system, armies of ascetics and cityfolk alike cry out, “Bolo Ganga-mayiya ki jaya! shri Yamuna mayiya ki jaya! [All glories to the Ganges and Yamuna! ]” creating a thunderous symphony of reverential incantation. During the sacred bathing period, caste and racial divisions and the demarcations of various cults and sects dissolve, as one person assists the other in cleansing the body and the soul. The Festival serves as a melting pot for more than eight thousand groups and religious institutions. Here they exchange philosophical ideas and share spiritual realizations. Some say the mela is a symbol of Hindu unity, offering a means of transmitting the spiritual and ascetic values of ancient Vedic culture to the masses of devotees. Cornered by Buddhism, Jainism, and Islam in the eighth century, Hindu civilization (more appropriately called Vedic civilization) was thought to be in danger of extinction. Therefore Sankaracarya, India’s ninth-century religious reformer (and, according to the Puranas, an incarnation of Siva), instituted at the Kumbh mela regular summit meetings of spiritual leaders as a buttress for the survival of Vedic theism. Some say that it was Sankaracarya who started the festival, but scriptural references about the Mela predating Sankara prove such a theory inaccurate. The Mela has become a forum by which the saintly and self-realized impart by example mystical and moral codes to the devoted. Alongside enlightened spiritual masters, however, fakes and frauds abound. History: It is described that while Durvasa Muni was passing on the road, he saw Indra on the back of his elephant and was pleased to offer Indra a garland from his own neck. Indra, however, being too puffed up, took the garland, and without respect for Durvasa Muni, he placed it on the trunk of his carrier elephant. The elephant, being an animal, could not understand the value of the garland, and thus the elephant threw the garland between its legs and smashed it. Seeing this insulting behavior, Durvasa Muni immediately cursed Indra to be poverty-stricken, bereft of all material opulence. Thus the demigods, afflicted on one side by the fighting demons and on the other by the curse of Durvasa Muni, lost all the material opulence’s in the three worlds. Lord Indra, Varuna and the other demigods, seeing their lives in such a state, consulted among themselves, but they could not find any solution. Then all the demigods assembled and went together to the peak of Sumeru Mountain. There, in the assembly of Lord Brahma, they fell down to offer Lord Brahma their obeisances, and then they informed him of all the incidents that had taken place. Upon seeing that the demigods were bereft of all influence and strength and that the three worlds were consequently devoid of auspiciousness, and upon seeing that the demigods were in an awkward position whereas all the demons were flourishing, Lord Brahma, who is above all the demigods and who is most powerful, concentrated his mind on the Supreme Personality of Godhead. Thus being encouraged, he became bright-faced and spoke to the demigods as follows. Lord Brahma said: I, Lord Siva, all of you demigods, the demons, the living entities born of perspiration, the living beings born of eggs, the trees and plants sprouting from the earth, and the living entities born from embryos—all come from the Supreme Lord, from His incarnation of rajo-guna [Lord Brahma, the guna-avatara] and from the great sages [rsis] who are part of me. Let us therefore go to the Supreme Lord and take shelter of His lotus feet. after Lord Brahma finished speaking to the demigods, he took them with him to the abode of the Supreme Personality of Godhead, which is beyond this material world. The Lord’s abode is on an island called Svetadvipa, which is situated in the ocean of milk. The Supreme Personality of Godhead directly and indirectly knows how everything, including the living force, mind and intelligence, is working under His control. He is the illuminator of everything and has no ignorance. He does not have a material body subject to the reactions of previous activities, and He is free from the ignorance of partiality and materialistic education. I therefore take shelter of the lotus feet of the Supreme Lord, who is eternal, all-pervading and as great as the sky and who appears with six opulence’s in three yugas [Satya, Tretä and Dväpara]. When offered prayers by Lord Siva and Lord Brahms, the Supreme Personality of Godhead Lord Visu was pleased. Thus He gave appropriate instructions to all the demigods. The Supreme Personality of Godhead, who is known as Ajita, unconquerable, advised the demigods to make a peace proposal to the demons, so that after formulating a truce, the demigods and demons could churn the ocean of milk. 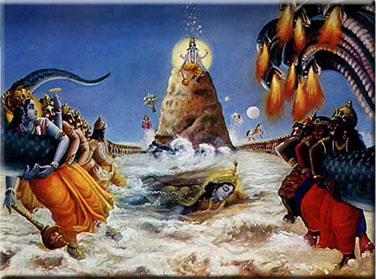 The rope would be the biggest serpent, known as Vasuki, and the churning rod would be Mandara Mountain. Poison would also be produced from the churning, but it would be taken by Lord Siva, and so there would be no need to fear it. Many other attractive things would be generated by the churning, but the Lord warned the demigods not to be captivated by such things. Nor should the demigods be angry if there were some disturbances. After advising the demigods in this way, the Lord disappeared from the scene. One of the item come from the churning of ocean of milk was nectar which will give strength to demigods. For twelve days and twelve nights (equivalent to twelve human years) the gods and demons fought in the sky for possession of this pot of Amrita. From this nectar some drops spills at Allahabad, Haridwar, Ujjain and Nashik while they were fighting for nectar . So on earth we celebrate this festival to get the pious credits and meet the purpose of life that is going to back to godhead our eternal home where our father is waiting for us. This is opportunity we get after associating with saints or holy man who follow scriptures. Kumbh mela provides us this great opportunity to purify our soul by bathing in holy river and serving saints.